See more Rapco RoadHOG Instrument Cable 10 Ft. 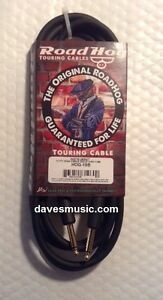 Details about RapcoHorizon Road HOG Instrument Cable 10 ft. Black US-Made! Priority Shipping! RapcoHorizon Road HOG Instrument Cable 10 ft. Black US-Made! Priority Shipping! Thanks for a great deal!! !